A few days ago, I heard that Samuel French Film & Television Bookshop, is closing its Sunset Boulevard location at the end of this month. I felt crushed by this news. Samuel French, especially the Sunset blvd. location ( other locations still live on,) has been one of my favorite places since I was a teenager. Bookstores are magic and for a theatre lover, Samuel French is the most magical of all. My love of theatre and plays began well before I discovered Samuel French. It started in elementary school, when I was about ten and I found the play section at our local Crown Books. My mom and I used to have an amazing ritual, where every Friday night we would go the bookstore and she would buy us each a new book. As soon as I discovered theater, I began to amass quite an impressive collection of plays. Neil Simon, especially his Brighton Beach Trilogy, was the first playwright that I really loved. I read plays and became familiar with playwrights, before even attending my first play. My mom had instilled a love for books and movies (our Sunday morning ritual was a trip to the cinema), but she wasn't a fan of live theater. As soon as I saw my first play, I was hooked. It was a production of The Phantom of the Opera at the Ahmanson Theatre in downtown Los Angeles. I would guess that many Los Angeles kids of my generation had this same show as their first musical or theatre experience. It ran at the Ahmanson Theatre for four years and to say it was a big deal in Los Angeles is an understatement. I ended up seeing it seven times during its run. Shortly after, I auditioned for The Los Angeles County High School for the Arts (LACHSA) and was accepted to begin my sophomore year as a theatre major. I love theater and respect the art of acting, but acting was never for me. I love my high school, the friends that I made, and the many incredible experiences that it afforded me, but I wish at the time that my school had offered a writing department. It would have been a better fit for me. I did take the optional playwriting classes, where I worked on abysmal experimental theater pieces that I’d be mortified if they ever come back to haunt me! It was through LACHSA, that I discovered Samuel French Bookshop. It changed my life. My passion for plays was no longer relegated to the single bookcase that most bookstores offered, but now I had an entire store of theatrical books. AN ENTIRE STORE!!! Samuel French had two locations in Los Angeles. The smaller location was in Studio City and it’s lovely, but the real prize was the Sunset Boulevard location in Hollywood. Both bookstores were located about a twenty minute drive from my house, but asking my mom for a trip to Samuel French, was akin to asking her to drive me to Florida. She hated it. I think worse, she knew that it wasn’t as simple as a quick shop, that she could leave me to browse all day. She would agree to quarterly visits or if I desperately needed something for school ( this was the early/mid 90’s, before online shopping was a thing) and she would wait in the car with a novel, while I had about an hour to shop. When I had my first car and could drive myself, it was bliss. I would spend hours discovering new playwrights. Samuel French on Sunset blvd was my happy spot. I continued to be a regular customer for many decades and it was a bookstore that not only brought me so much joy, but opened me up to new writers and new worlds. Learning about the closure, I’m not only sad for what will no longer exist, but I feel guilty. Through changes in my life and reading habits, I have not been a recent customer. I have not visited Samuel French in over five years. One of the reasons that the store is closing, is because more customers are shopping online, they cannot justify a brick and mortar store. The delight of browsing and the thrill of discovery is a unique aspect of physical bookstores. I am using this as a stark reminder, to keep shopping at physical bookstores, to keep spending my money in the stores, rather than online. As much as I love the convenience of online shopping, it simply does not replace the magic of a physical bookstore. Online stores cater to well-known authors, rather than exploring new or lesser known talent. The experience for a book lover does not compare. Samuel French will continue to exist in other physical locations and online, but it hurts that the Sunset location is closing. It really hurts. 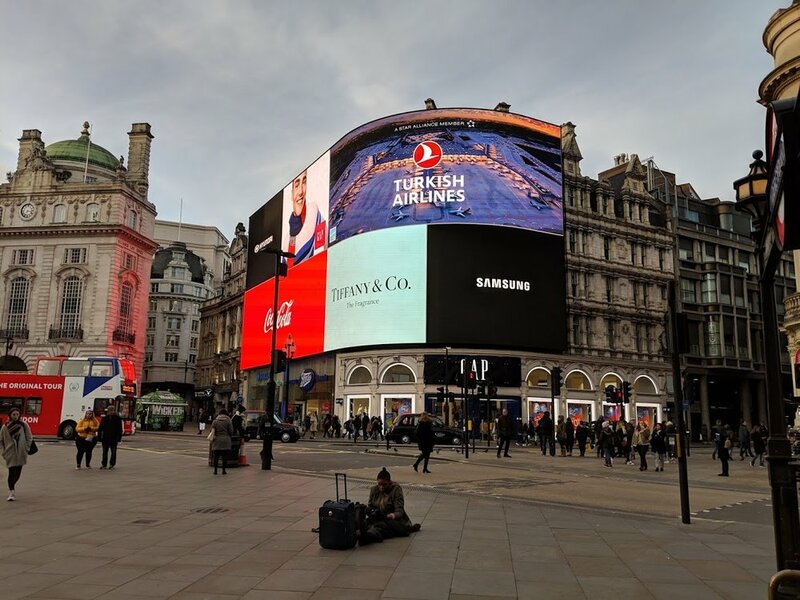 In early January 2019, I was blessed with three days in England to visit family. On one of those days, I hopped on a train and went to London with my niece, Pippa. 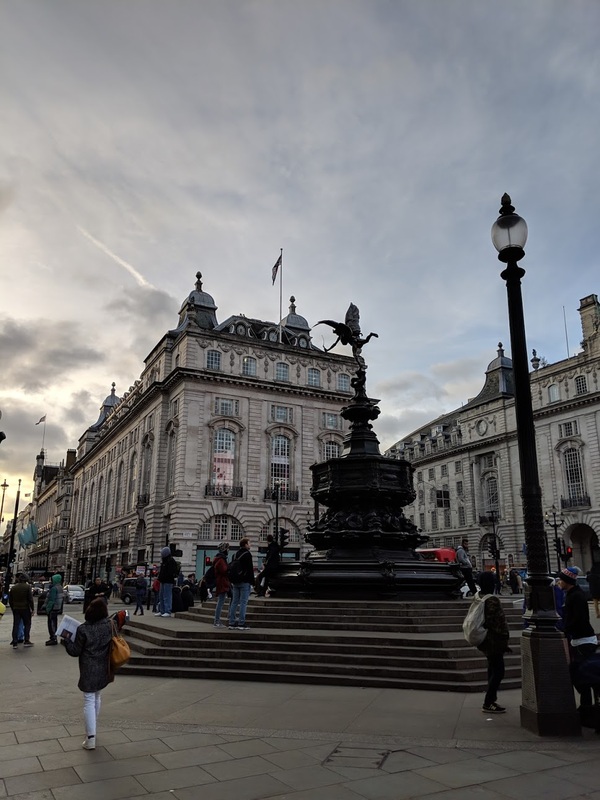 London is one of my favorite places in the world and I really didn’t think that I would have the opportunity to visit it on this brief trip. I was thrilled when Pippa asked me to join her for a day trip. We left mid-morning and arrived in London around lunch time. The first stop was Covent Garden, a covered mall filled with unique shops and restaurants. 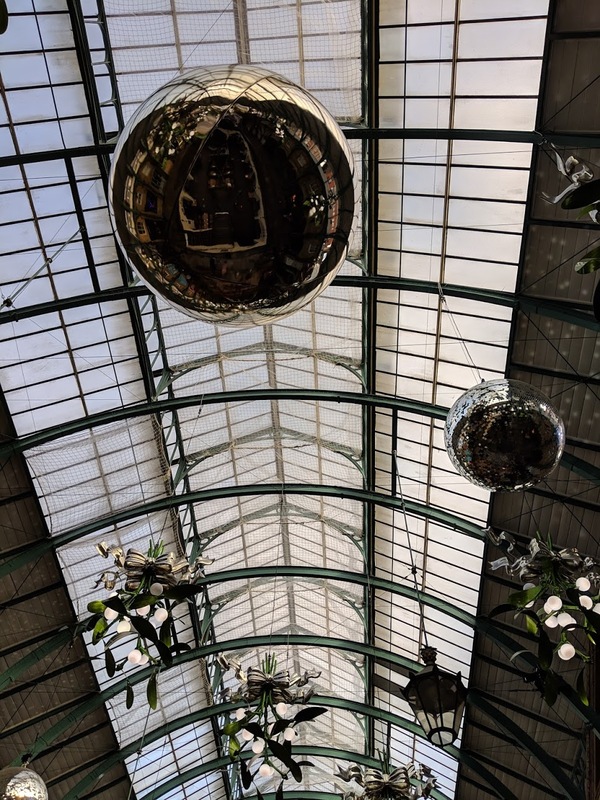 Although it is very famous, I had not previously visited Covent Garden on my trips to London. We poked around in the shops; a wide variety of both high-end and quirky specialty stores. We spent quite a bit of time in Miller Harris, a fragrance shop. I wasn’t taken by any of the scents, but I loved that they had a collection named after the novels of F. Scott Fitzgerald. The bibliophile in me, nearly opened my wallet! It was a bonus that Covent Garden was still decorated for Christmas. As we were walking around, we heard an amazing voice and discovered an opera singer busking. It added an element of magic to start our day in London. We were feeling parched, but it seemed in poor taste to start drinking alcohol before lunch, so we stopped for tea at the St. Martin in the Fields: Cafe in the Crypt. Many times, I have passed by the Cafe in the Crypt and had wanted to try it. My husband has even attended a corporate party in the crypt! Just as the name implies, it is a cafe that is located in a crypt. 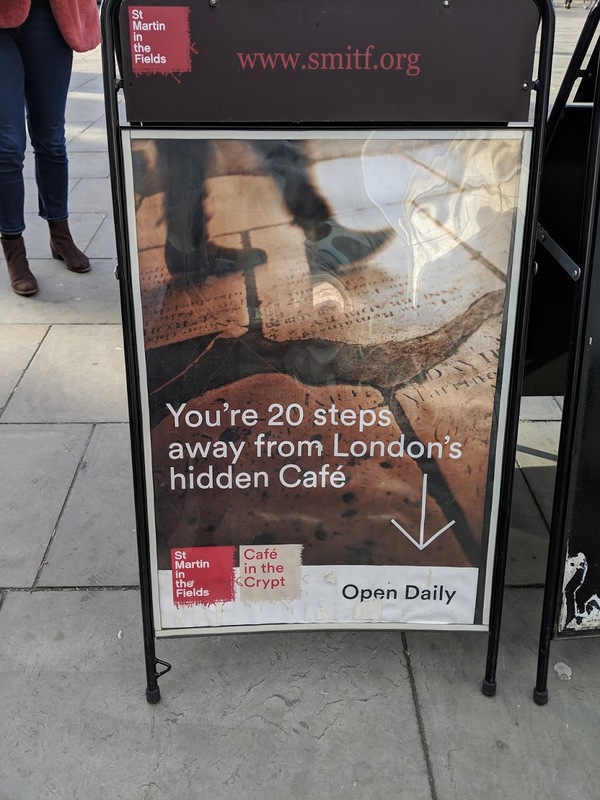 I love the cheeky signs that they have advertising the cafe. It’s more of a cafeteria than a cafe and they serve full-on lunch items. We kept it simple with pots of English breakfast tea. Our visit was around 1ish in the afternoon and the place was absolutely jammed, we were lucky to find a table. I would definitely visit again, but likely during off-peak hours. We just don’t have these types of places in California, so it was a little odd enjoying tea over the graves. It made me wonder how I would feel if my resting place was turned into a cafe. I think it would make me happy to know that life was carrying on above me and that I ended up in a place were people were eating cake! 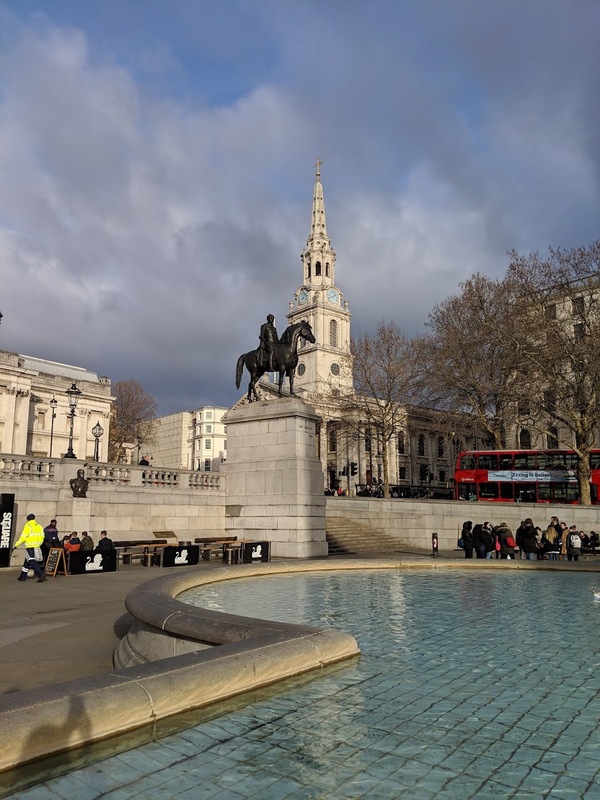 A quick walk through Trafalgar Square and some snaps. It was chilly outside, so we didn’t linger. Under Pippa’s recommendation, we went to Franco Manca for lunch. Franco Manca makes great, inexpensive pizzas. I tried Green Cola. I ordered it not knowing what to expect. It wasn’t green in color and it tasted very similar to Coke, yet it was hyper-effervescent. 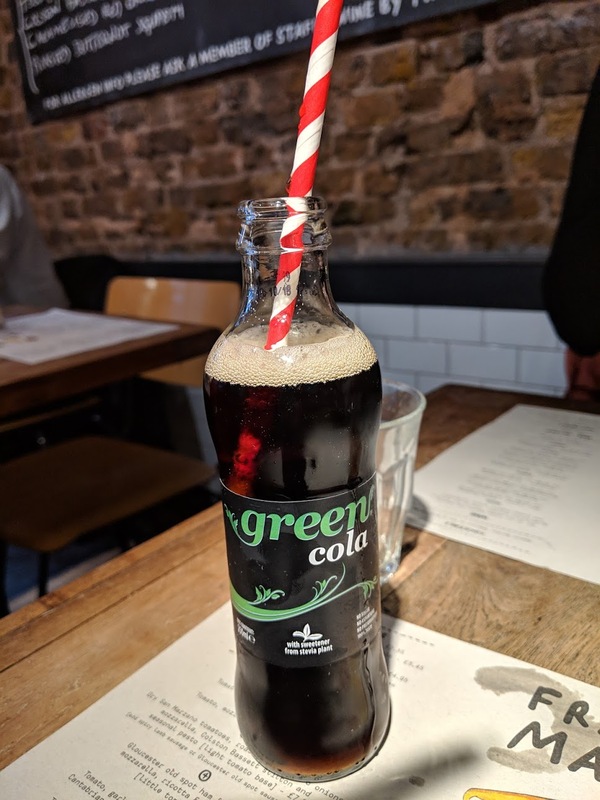 Every time I took a sip, it would bubble-up so much, that the paper straw would rise and the soda threatened to cascade over the side of the bottle. 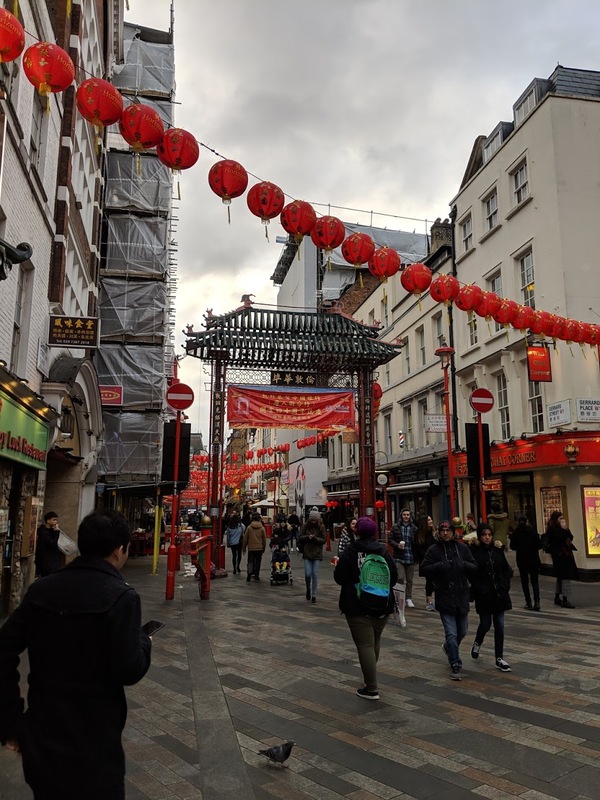 We had already decided that this would be a day of food and drink indulgence, so our next stop was Chinatown for some yummy bubble tea at Cuppa Cha. This was my first experience having bubble tea served warm, but it was the perfect cold day treat. Cuppa Cha is a cheerful shop with a fake-grass, indoor/outdoor theme. It brought color to a grey, London day! 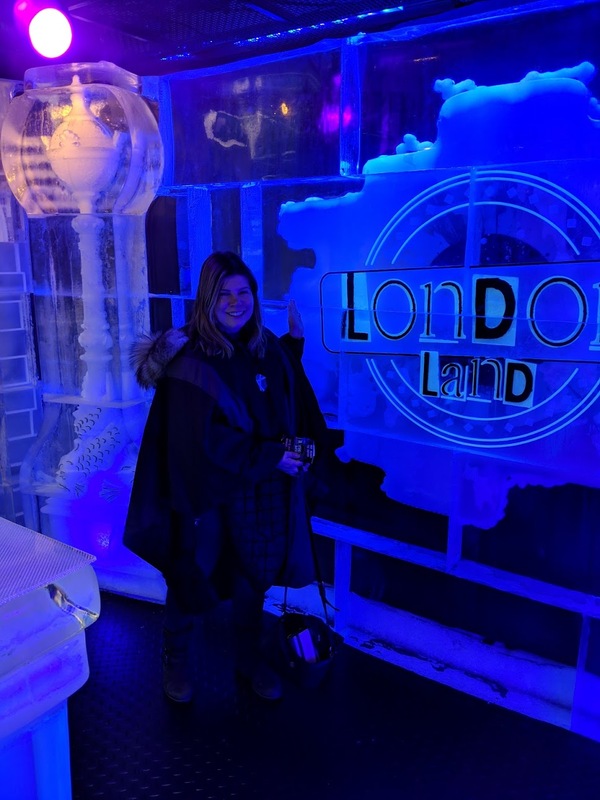 This was my first experience at an Ice Bar, something that I’ve long wanted to try. 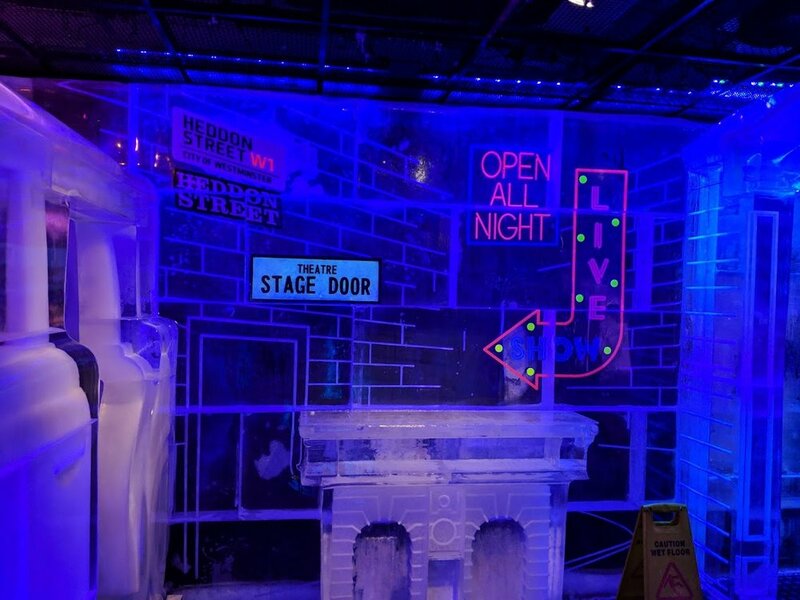 The ice bar area is small and they allow a limited number of people to enter in 45 minutes time blocks. It seems that they book-up in advance, but we were very lucky to arrive (without buying tickets in advance,) just as a session was starting. Our session only had about ten people and I imagine that it easy holds triple that amount. For 13.50 pounds each, we were given entry to the Ice Bar, including our first drink. Before entering the cold, we were outfitted with thick, quilted capes that had a hood lined with faux-fur and warm mittens. This outfit is necessary. We were still very cold and didn’t even last the 45 minutes. We even met a woman that was wearing heels and she was suffering. This is not the place to be fashionable, just dress for comfort! 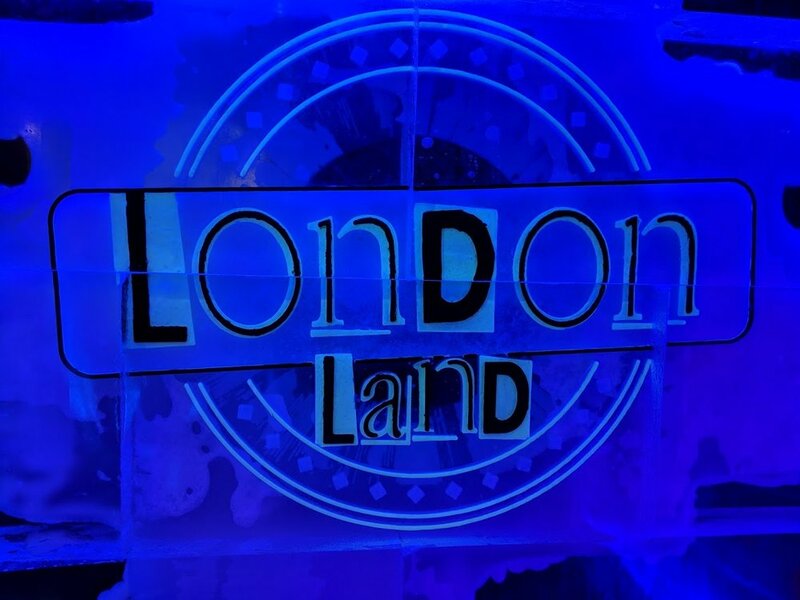 We entered the Ice Bar to see a display of sculptures featuring icons of London, called London Land. I read on the BelowZero Ice Bar website, that this theme will go on until May 2019 and then will be changed for something new. They even had a taxi made of ice, that you could climb in and watch a video window showing views of London! Half the fun of the experience was taking pictures with all of the sculptures. We were able to pick our included drink from an extensive cocktail menu, something for everyone’s tastes and they were served in a thick glass made of ice! This was fun, but slippery- you must wear your gloves when picking up the glasses. As you can imagine, they were also very cold to drink from! The cocktails were okay, but from pre-made mixes and not very high quality. We had the option to open a tab and order more, but one was enough. We were left with the impression that it is a fun experience, but more of a gimmick, than a great bar. 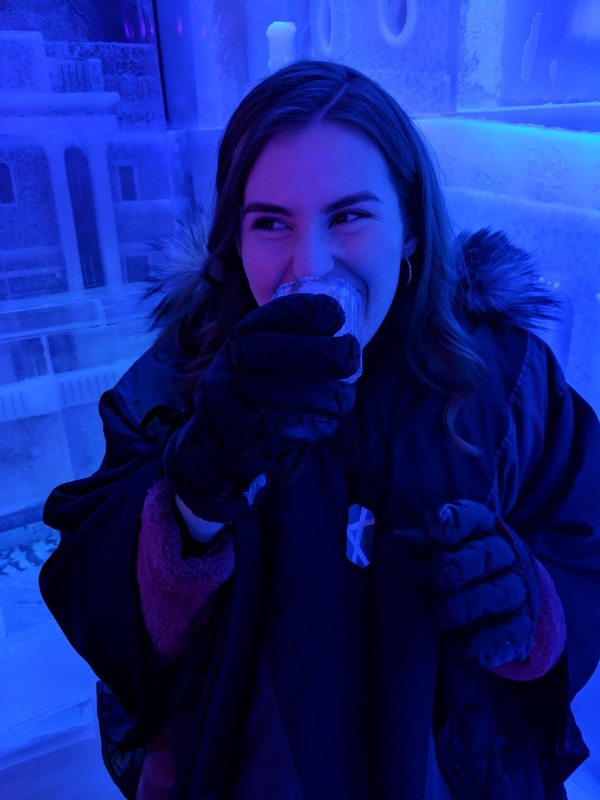 To be fair, BelowZero Ice Bar, also has a restaurant/bar, that is separate from the Ice Bar Experience and the drinks might be amazing. Amazing drinks were had at Aqua Kyoto. Not only were they delicious, but they were absolutely gorgeous. Aqua Kyoto is a stunning Japanese restaurant, with an elegant bar. I was shamefully under-dressed in my jeans and clunky boots, but I owned it and enjoyed the experience. The next time I’m in London with my husband, I need to bring him here for a date-night. Loved it! A perfect day in London is not complete without theater tickets. I was very excited to see Sam Shepard’s True West at the Vaudeville Theatre. But on the walk to the theatre, I had a momentary blip of envy, as I felt the excitement of ticket holders entering to see Harry Potter and the Cursed Child. I can best explain it like this, it was like everyone entering to see Harry Potter and the Cursed Child, was about to go on a brand-new ride at Disneyland ( or more apt-Universal Studios) and we were headed for an NPR event! This is not to diminish the amazing experience that I had watching True West, as it was fabulous, just to say that there was a very different energy outside of each theater. But then again, we had John Snow! After the show, we enjoyed a glass of wine at a wine bar next to the theatre, before heading to Paddington Station to catch the last train home. I’d be remiss, if I did not add that we had a very late-night dinner at the grossest McDonald’s ( and that’s saying a lot!) at the train station. My husband was appalled and has not let me live it down. He keeps calling me “A Dirty Stop-Out.” How British! I know some people think it’s silly, but I love creating a New Year’s Resolution list. This isn’t to say that I don’t start other goals throughout the year, but there is something about the start of a new year that feels like the perfect time to reflect and initiate change. As usual, I’m going to start by looking back on my 2018 resolutions. 1. Create a writing schedule with a focus on the revisions for my novel. - A big fail. I did write quite a bit in 2018, but I could not figure out a steady schedule. I could not figure out how to organize this aspect of my life. 2. Finish revising my novel and begin sending it out to agents. - I made a lot of progress on my novel and I am pleased with my progress, but the revision process has been much slower than anticipated. 3. Maintain blogging schedule of every other day. This has been my normal schedule for years, but life got in the way this year and I didn't always stick to it. I felt guilty when I didn't. - Epic fail. This was my most inconsistent blogging year to date. I am so back-logged. I feel like I really let myself down with this goal. 4. Read 75 or more books. - Hanging my head in shame. I only read 34 books. This is the least amount of reading that I’ve done in my adult life. 5. Maintain a food log and eliminate soda. - Fail. Although there is hope with this one. I just got a Fitbit and started tracking my food. This was after getting blood work done in December and realizing that I had to make changes. 6. Work on scanning old-family pictures. Try to get 1/4 of pictures scanned. This has been a resolution from years past that I never managed to accomplish. It's a big project. - Fail, no progress. 7. Work on family genealogy project. - Yes! I have been down the rabbit hole of family history quite a bit this year. It’s exciting and informative. I can trace back to the original colonists and I have family members who formed towns in Massachusetts. I also found out that the real life Hester Prynne ( from Nathanial Hawthorne’s The Scarlet Letter) had some sort of relationship with one of my ancestors and it was a scandal! 8. Super secret podcast idea- put into action! I'm very excited about this one. - I’ve worked on a plan and discussed it with a friend who has a Podcast, but I’ve not moved forward on this. I still feel momentum, but I’m not sure how to work it into my schedule. 9. Visit a new country, state or major city.- I traveled so much in 2018, but primarily to places that I’ve already visited. I did see some new cities in England, like Oxford and Windsor. I had many new experiences in the cities that I had previously visited. 10. Attend a writer's conference. I have my eye on the Las Vegas conference in the spring. - No. I’m kicking myself for this one too, although it simply did not work with our schedule or finances for this to happen in 2018. 2018 was a terrible year for resolutions, yet it was a fabulous year for life in general. I spent a lot of time developing relationships with family and friends. I ended one job and started another. Although my goals that I set at the start of the year fell flat, many new goals and opportunities appeared throughout the year. I don’t look at this list as a fail, but as an indication that things have changed. 1. Creating a writing schedule with a focus on my novel = I’m carrying this over. I feel better about accomplishing this, because the last third of 2018 has seen a shift to a more consistent schedule. I’ve been waking up at 7am and I have a regular work schedule. I now need to fit writing time into that schedule. I need the routine to stick. 2. Attend a Writing Conference = I really want to attend AWP in Portland, but that might be a financial stretch. I still have my eye on Vegas. 3. Maintain a blogging schedule= I am shifting this goal to three days a week, rather than every other day. I need to be consistent about the posting days and times though. 4. Read 60 books or more = Achievable. I need to focus on meeting my book review schedule commitments from publishers and stay on track. I also need to whittle down my massive, over-flowing bookshelf. 5. Track food and get to a healthy weight = I need to lose a few pounds, not a lot, but a bit. The primary goal is to fix some issues from a recent blood test. I would like to focus on diet, rather than have these problems require medication. I will likely eliminate soda and cut back on sugar to reach these goals. I never had trouble losing weight when I am mindful. 6. Track steps and be mindful about exercise - I have a Fitbit and have started becoming more aware of my need to move more, especially when I have been glued to my computer all day. I’d also like to take some pilates classes at a local studio or join a gym. 8. Scan in old-family photos and documents- I will be really disappointed if I don’t make progress towards this goal in 2019. It’s long over-due and I’m worried that something might happen to these precious objects. 10. Work More, Save More, Spend Less = General mindfulness when it comes to finances. I’ve made progress towards this in the last 3-4 months. 11. Invest in my tutoring job = become certified to teach for language tests or create more teaching tools to have on hand. When I look at all of these goals, the main theme seems to be mindfulness leading to creating good habits. I’m looking to make long-term changes. I also need to find a way to keep these routines, when life becomes less predictable = holidays, family visits, the unexpected, et… Rather than starting January 1st, my New Year’s reset will begin on January 14th, when I have returned home from a holiday trip to Europe.